The technology we use changes rapidly and our students will work with tools and social media many teachers have little knowledge using. However, teachers do have the ability to help students practice various skills using technology. We can get students to problem-solve, code, program, create, publish, troubleshoot, experiment, research and so forth with technology. One of the most important skills students will need is to present themselves with technology. They will need to impress employers with what they’ve created, researched, problem-solved, and published with technology. Getting students to create digital portfolios of their work in our classes will give them experience in figuring out how to present themselves online and also gives learners a reflection of their abilities and talents they’ve acquired throughout the learning journey. Many free curation and aggregation tools and apps, like Educlipper, Pinterest, and Livebinders, help students to quickly and easily create their portfolios and keep them throughout their learning journey. I also love Google Apps and Weebly for creating impressive portfolios. 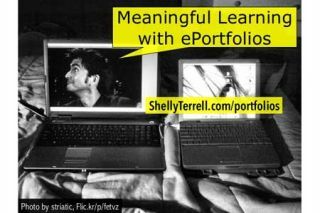 Check out my Weebly portfolio at ShellyTerrell.com as an example. For my courses, my students use these curation tools to build their eportfolios. Find examples of my students’ Pinterest portfolios and how I set up the project and assessed it in the presentation below. You will also learn about their final projects culminating the knowledge they gathered from their portfolios. Students create a reflective audio/visual presentation, in which they reflect on a task, reading, and resource (tool, app, website, game, database, video or program) for each module. Their presentations include screenshots, links, and examples. Students are asked to describe what they learned from the resources and explain how they will specifically apply this knowledge in the real world. Keep scrolling for bookmarks with more ideas. Get your students to create digital posters this year and share their research with others.